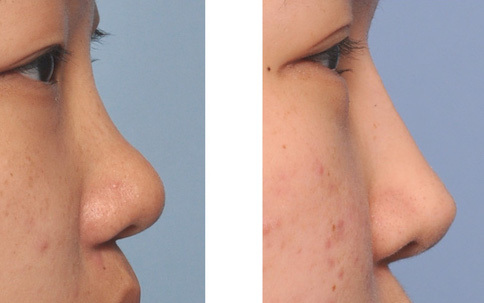 Many Asian patients that seek rhinoplasty have some similar anatomic features to their nose. The bridge of the nose is low and the nasal tip has poor projection with a wide nostril base. This has led to an overall augmentation of the dorsal profile from the radix down through the tip. But in some Asian patients their anatomic features can create the appearance of a nasal hump at the osteocartilaginous junction. This is really a pseudohump or ‘fake hump’ as this area along the dorsal line is not high….it is just that everything above and below it is too low. It is clear in these patients that major reduction of a pseudohump is not the correct surgical approach but augmentation above and below it is the more major need. In the April 2019 issue of the Annals of Plastic Surgery an article was published entitled ‘Use of an Augmentation Spreader Graft for Management of Nasofacial Angle in Patients With Pseudo-Hump’. In this paper the authors review their experience in almost Korean one hundred patients (97) who underwent hump reduction with radix augmentation (using hump fragments) and dorsal augmentation with septal cartilage spreader grafts. No implants were used. Anthropometric analysis and patient satisfaction were determined one year after surgery. This paper demonstrates that a modified augmentative technique with cartilage spreader grafts above the septal height can create adequate dorsal augmentation. This combined with a small amount of hump reduction and concomitant radix and tip augmentation avoids the need for implant materials to create a pleasing nasal profile.